Wow! What a design! That’s the expression you will have as soon as you press the Spin button on the Rocket Returns slots game. Immediately you notice that it is like nothing else you’ve ever seen on the main screen of a slots game. The layout presents itself in a space-age motif and is clearly designed to best fit a mobile app with the device held in the portrait position, as opposed to being conceived for a land-based or online format more suitable to a widescreen laptop. For starters, it has 9 hexagons which hold the reels and paylines, usually but not always in a 3x3 grid. Trying to keep track of all the game’s symbols in such a format keeps the right and left sides of the brain in a constant state of playful combat. This is the point that I usually stride into my essay about the game’s theme. I really like analyzing the motifs of slots games because you can tell right away how much thought and under-the-hood technology has been poured into a slots game by how surprising, sophisticated, and well balanced the theme is, and how well the different characters and symbols complement each other. Well, alas, this game has no theme, at least none that I can discern. There are just numbers and symbols in a 9-hexagonal pattern that are contiguous or touch each other. That’s it. Sure, there are sticks of dynamite about to explode and rockets about to launch, but they can be placed in almost any other theme when their sole function is to explode and take off each time a gamer wins a prize. Sorry, but to me, that’s not a theme. The game comes with only five Symbols for Prizes, a red Stick of Dynamite Symbol with its wick on fire for the Wild, and a symbol for Bonus Spins portrayed as a white and red striped rocket with its fuse lit and sizzling. Both explode in glorious fashion when you win a prize. The remaining symbols are a triple Bar, a Double Bar, a Single Bar, an Orange 7, and a Blue 7. The Wild symbol traditionally assists you in getting a winning combination by substituting itself for all less powerful symbols on a payline, except for the more powerful Scatter Symbol. Winning combos that contain a Wild symbol will be multiplied up to 3x your line bet. Unfortunately, in this game, the Wild symbol can only land on reel 5. We don’t want to forget about the game’s Scatter Symbol. It is represented by a purple background with a Rocket in front of it. Getting at least 3 Scatter symbols on reels 9, 5, or 1 triggers the Bonus Rounds feature for 5 spins. Landing more Scatter symbols nets you additional free spins up to 5 free spins. Rocket Returns has 228 paylines in the combined 9 hexagons. This certainly increases your chance of hitting a winning combination. 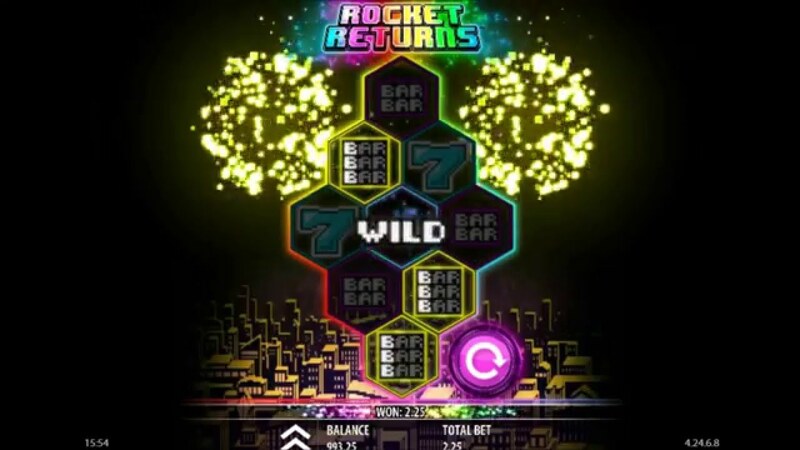 The Bonus Rounds will be triggered by soon to explode Rockets when they land on Reel 1 in Hexagons 9, 5, or 1. The proper landing will trigger up to five free Spins. Additional Bonus Spins can be triggered during Bonus Spins. Any prize won during a Bonus Spin gains a 5x multipliers of your stake. Finally, three Rockets that land on the reels simultaneously nets you an additional multiplier. The Sticks of dynamite are designed to blow other game symbols off the reels and replace them with substitute symbols that will result in a winning combination, thereby increasing your chances of winning. Any Wild Stick of Dynamite that lands on an active reel will come with a 3x, 2x, or 1x multiplier that doubles or triples your line bet, or finally, result in free Bonus Round. All winning Prizes are multiplied by what you bet on the line. Thirty times is the top payout for the five prize symbols for 200x for any one of the 7s, 100x for the three-bar symbol, 50x for the double-bar symbol and only 30x for the single-line bar symbol. So grab the opportunity to be the first of your chat group to play this unusual but fun game and be the first to tell everyone in your chat rooms. Remember, if you can’t afford a weekend in Vegas, you can always login online and give this free Rocket Returns slots game a yeoman’s try.